NICU stands for Neonatal Intensive Care Unit. The job of those who work in the NICU is to care for babies with serious medical problems. 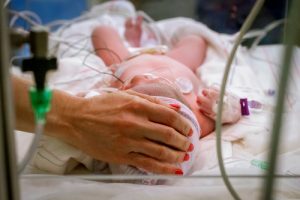 Most babies in NICU are born prematurely (before 37 weeks), have a birth weight lower than 5-1/2 lbs., or have suffered from a loss of oxygen during labor or delivery. Many premature babies have low birth weights, and a lot of premature births occur with twins and other multiple pregnancies. Premature newborns and those of lower birth weight are more likely to suffer from infections and other health issues. Certain factors play a role in whether or not a child will be admitted to the NICU. These can range from maternal condition to varying health circumstances of the baby. Delivery details also factor it: if a child is breech, the mother suffers from diabetes, or there is respiratory distress, the baby is more likely to be admitted to the NICU. For parents, having a newborn baby in NICU is a terrifying and upsetting experience. No one wants to see their infant on a ventilator, needing a feeding tube, or undergoing brain cooling. Fragile NICU babies are tended to by professional, specially trained medical personnel. The Neonatal Intensive Care Unit typically staffs dietitians, pharmacists, doctors, nurses, therapists, and other important caretakers. These specialists work together to create a plan of action that will appropriately tackle each newborn’s individual ailment. When a baby is placed in the NICU, it means their health and life is in danger. They are in need of special, round-the-clock care. Every treatment must be elected following specific specific guidelines and administered with the utmost care. This includes everything from which nutritional formulas are best to what medical equipment is used. When a baby is brought into the world, every effort should be made to ensure a healthy delivery. The stakes are even higher if the child needs to be admitted to the NICU. Any miscalculation or negligent act by the doctors or nurses can be disastrous to the baby’s health. If a trusted medical professional fails to treat an infection, misidentifies an ailment, improperly utilizes medical equipment (such as a breathing tube or IV), administers the wrong kind or amount of medication, or fails to give the appropriate amount of oxygen or antibiotics, permanent damage may be done to the baby. Results of such errors can range from brain bleeds to cerebral palsy, seizures to developmental delays, and even death. Improper care within a NICU – Neonatal Intensive Care Unit can leave a family broken by a child’s death or permanent disability. It is your right to receive monetary compensation and justice for such negligence or misconduct, and Thurswell Law can help. Since 1968, we have been representing victims of birth injury cases and bringing them the compensation they’re owed to take care of the child’s specialized healthcare needs. Contact us today by calling toll free at 866-354-5544, and receive a free consultation. We will fight for you and your family against doctors, hospitals, and insurance companies, and there is no fee unless you collect.